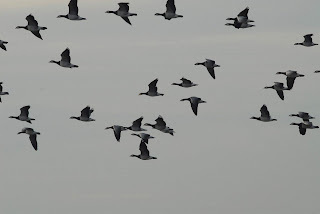 Highs and Lows of Birding: 'Bean and Gone' A Livid Goose chase! Working Saturday morning for the jolly old NHS I was some waht dealyed from getting across the water to savour the delights of Rainham RSPB, a cracking reserve close to home and a haven for birds and other wildlife. My quest, two species of Geese, Barnacles or 'Barnies' and Bean Goose, another great bird in the LNHS (London Natural History Society) recording area. I quickly rushed around to the area where the Geese wer in view but when I got there there was an absence of all things Goose like and only after nearly circumnavigating the reserve did I connect with the Barnies though sadly the Beanies had done a bunk................ I should have finished work earlier! !